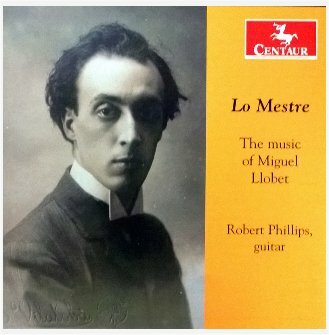 No recording of guitar music that has been influenced by the Impressionist composers could be considered complete without a work by Miguel Llobet, and the piece of his most associated with Impressionism is El Mestre. Llobet spent several years as a young musician living in Paris, where he associated with Claude Debussy, Maurice Ravel, and Manuel de Falla, to name just a few. He is known to have had a number of discussions with Debussy about the possibility of his composing a work for guitar, an idea to which Debussy seemed receptive. Sadly, this never came to fruition. He also spent years asking de Falla for a guitar composition, which eventually resulted in de Falla’s little masterpiece, Le Tombeau de Debussy. These associations had a profound impact on Llobet, and his compositional style evolved from the Chopin influence of his earliest works to a more Impressionistic aesthetic. I have already recorded El Mestre – it was the “title piece” of my Centaur Records release, “Lo Mestre, the music of Miguel Llobet.” (A word about the title discrepancy in a bit.) So the jury is out as to whether or not to re-record it and include it in the new album. Certainly many musicians have recorded the same pieces multiple times, but on consecutive albums? On the other hand, there will be a couple of years in between my last album and my next. Also, I believe I have something different to say about the piece interpretively. And, of course, as I said in the first sentence of this post, no recording of Impressionism for guitar would be complete without it. In any event, since I am at least considering including El Mestre, I am including it in my youtube channel playlist, “Impressions”. Now, about the title discrepancy: The work is published under the title “El Mestre“, but in 1975, when I studied it under Rey de la Torre, Maestro Rey put an X through the “El” in the title and wrote “Lo” above it. Since he was Llobet’s most significant pupil, it is pretty hard to ignore the probability that, as Rey told me, Llobet originally called it “Lo Mestre“. For this reason, I decided to use what I believe is Llobet’s original title as the album title, but continue to use the published title when referring to the piece. So, here is my recording of El Mestre as I recorded it back in 2011 (2 years before the recording that found its way into the album). I just came from conducting a concert of my students from Harrison School for the Arts. They are a great group of high school students, but I often have to remind myself, they are high school students! The music that they played was challenging, and their playing was on a very high level, but the past week has been very stressful because their playing has not been consistent. So when I got home this evening, my wife, Kathy, asked how the concert went, and I was able to tell her that they pulled it off! Kathy wondered out loud how it is that they were able to play well in the concert, but were so inconsistent in rehearsals. That set me to wondering, and I reached a conclusion, a kind of “aha!” moment. As a professional player, I bring my “A” game to every rehearsal. When my instrument comes out of the case, I am giving all of my energy and all of my attention to the music and to my playing. When I perform with other professional players I take for granted that they will do likewise. But at some rehearsals the students played poorly, and in others they were outstanding. I couldn’t make sense out of how they could play well one day and poorly the next. The inconsistency in the rehearsals left me wondering if they were really up to the level required by the music. But faced with an audience, and with Mom, Dad, grandparents, and friends sitting in the house they played well. Then it occurred to me that the problem wasn’t that they couldn’t play the music. The problem was that they were not giving 100% at the rehearsals! They were not bringing their A Game. So, when push came to shove these students were able to pull off a pretty impressive performance. But here is the problem. By not bringing their best to every rehearsal, these students were bringing an element of risk to the concert that is, to my way of thinking, unacceptable. They pulled it off this time, but can I be sure that they will the next? I can not! And as well as they played in the concert, how much better might they have played if they had been completely present at every rehearsal? So it occurs to me that one of the differences between a group of talented kids and a group of seasoned professionals is this work habit. A pro gives 100% every time. Thinking back to a recent concert in which I played with Andrew York, he and I had two short rehearsals prior to the concert. During the first rehearsal we had little to say to each other (in a good way) to make the music better. We both played all the notes, all the rhythms, all the nuances, and played with each other. By the second rehearsal we were engaging each other in a real musical conversation, and by the concert, we were interacting deeply and playing off each other with conviction and passion. We were both confident in the playing because we had both been completely involved from the first note of the first rehearsal. This is the quality that is missing in many student performances. As I said before, they are talented high school students, but they are high school students. So it is incumbent upon me as the teacher and as a professional to impart this work ethic on them. I’ll make a point of having them read this blog, and hopefully they, and all of my readers will be inspired to consistently bring the A game to every practice and every rehearsal. When anyone asks me what I do I tell them that I play and teach classical guitar. And yet this doesn’t really describe all of my activities. I’ve discussed the need to diversify stylistically in order to make a living as a musician, and this is a concept that I take very seriously. For example, this past Saturday I gave a concert with the North American Choro Ensemble, which is certainly not classical guitar. In fact, even in the choro ensemble we have recognized the importance of mixing things up a bit, and our concert included some sambas and bossa novas. When playing choros, I try to improvise short licks and runs when repeating verses, and on the sambas and bossas the members of the ensemble go for straight ahead jazz improvisation. This keeps things interesting for the audience, which is vital if one wishes to perform regularly, and it also keeps it interesting for me. There is the added benefit that all of these musical activities contribute to making me a better musician, something I strive to do every day. On Sunday I played in a concert that was billed as “Geert D’Hollander and Friends”. So I was one of Geert’s “friends” for the evening (and hopefully his friend for life), This was a classical concert, with Geert playing several solo works on the piano (Chopin, Brahms, Faure, and Scriabin) and me playing solo guitar pieces by Miguel Llobet, Heitor Villa-Lobos, Augustín Barrios, and me. The setting was a large living room at an historic mansion on the grounds of Bok Tower Gardens. Interestingly enough, I must have driven this point home to my son quite well. He exemplifies diverse artistic expressions as a way of both making a living and growing artistically (and he seems to be having fun, which is equally important). Classically trained on violin, guitar, and piano (and also trained on jazz saxophone) he produced my Llobet recording. But what really makes this surprising is that he makes a good portion of his livelihood playing lead guitar with a heavy metal band, plays slide guitar and mandolin with a bluegrass/country band, and owns a recording studio! Now that’s what I call mixing it up! I debated long and hard with myself as to whether or not to discuss this publicly, but in the end decided that I would, so here goes. Last month I had surgery on my hand. It began late last spring or early last summer when I developed a “trigger finger”. The correct term for this condition is stenosing tenosynovitis. What happens when one develops this problem is that the finger gets stuck for a fraction of a second on contraction and extension, and then snaps into position. It is caused by a narrowing of the sheath that surrounds the tendon of the finger that gets stuck. The number of remedies available is limited – either a cortisone shot into the sheath, or a minor surgical procedure in which the sheath is severed. In my case, it was my right middle finger that was the problem. The point at which it would stick in contraction was not problematic because it occurred after the string was already plucked, in other words, in the follow through. The problem was that in re-extending it would also stick, and it was interfering with my timing because the finger wouldn’t get out quickly enough. So in the early fall I went to a hand specialist who gave me a cortisone shot along with a warning that the effect would be temporary, and that I would be limited to 3 such shots in my life. This, of course meant that surgery would eventually happen. I went for a follow up a few weeks later, and the shot had not completely eliminated the problem. Surgery was the only solution. A few other factors impacted my decision to have it immediately. I had a gap in my performance schedule that would allow for recovery without having to cancel any concerts. Furthermore, I was getting ready to sign a contract with Price Rubin and Partners artist management, and did not feel that I could in good conscience sign such an agreement until I was ready to perform without any encumbrances. On November 22 I had the surgery. It was an out-patient procedure performed in a hospital under general anesthesia. I was told that I would not be able to play at all for about 6 weeks, and could lift “nothing heavier than a cup of coffee” for that period. I awakened from the surgery to find my hand bandaged very heavily, so much so that it actually looked as if I had a cast on my hand! A couple of weeks later I had the stitches removed and was given a referral for physical therapy. I am writing this a month after the surgery, and my PT is going very well. There was very little pain after the procedure, but the PT is a whole different story! The main objectives of the therapy are to regain full range of motion and to prevent any internal scarring. The exercises designed to stretch my tendons are only a little painful, but the deep massage required to break down scar tissue is pretty painful. I have been allowed to move my fingers lightly, tapping on the strings delicately in playing patterns. This helps my dexterity, and makes me feel like I’m practicing at least a little. My therapist has told me that she believes I’ll be able to play by Christmas. I won’t be able to dig in and play hard, fast, or long, so everything will be adagio and pianissimo, but at least I’ll be playing again. This is the longest I’ve gone without playing in over 40 years! I’ll have to admit that I’m pretty upset by the idea of having surgery on my hand. Right before the procedure I told my wife that open heart surgery would be less scary for me! And I’m a bit bothered by the fact that my hand stopped working the way it should. But I suppose that at the age of 60, and with half a century of playing behind me, a certain amount of wear and tear is somewhat inevitable. However, the main thing for me now is that I believe I have sufficient movement to be able to play anything, and that I have full sensation in my hand and fingers. I’ll post follow-ups as I begin to regain my playing. I’ve taken David’s words very seriously, and have almost never turned down work, irregardless of how busy I think I am. I’ve already blogged about my practice/teaching schedule (June 17 – Daily Schedule), but this didn’t address some of the newer developments that have occurred. First of all, this year I find that my schedule of teaching at Southeastern University (my other teaching job after I finish a full day of teaching classical guitar at Harrison School for the Arts) has picked up tremendously. This year I have a dozen private students at SEU and I direct the guitar ensemble. In addition I have several private students that I see in my home studio. This is great for my economic security, but what about my artist’s soul? Well, that side of my life isn’t too shabby lately and is showing signs of increased growth. Which, of course, makes me busier! In my July 9 post, Back in the Saddle Again, and more extensively in my July 15 post, Back in the Saddle Again Follow Up, I talked about playing in churches. Well, I’ve begun to play in a church in my home city of Lakeland, FL twice every month. While it’s far from a full concert, I still have to practice a few pieces for these performances, which, although it doesn’t increase my practice time, keeps me on my toes. And I don’t want to play the same pieces in a short span of time, so I’m a little more serious than usual about learning new repertoire, which is something that I usually do during the summer. (This doesn’t mean that I don’t normally learn new repertoire the rest of the year, only that I’m not as aggressive about it as during the summer.) I’ve also given a few performances and have more booked in the near future. With my new recording, Lo Mestre, The Music of MIguel Llobet about to be released (February) I am keeping that extraordinarily difficult repertoire in shape in anticipation of several performances in order to promote it. And I’m still playing choros (see my May 22 post, Choros) and I’ve begun to write some of the arrangements of these pieces, something that Dave Miller used to do. This week has been particularly busy. I played in church Sunday. Then, on Monday recorded an interview with Jack Price (of Price Rubin and Partners, an artist management company that will be representing me in the near future). The company has a web radio site, PRP Radio One which does a daily artist interview. Some of the interviews are with A list artists that they represent (Pepe Romero, Angel Romero, Lalo Schifrin, Scholomo Mintz, etc.) and others are more in my league professionally. Tuesday I spent the evening producing a pre-production recording session for a student of mine who is getting ready to record his first classical guitar CD. Wednesday I actually had nothing after 8:00 PM, so I managed to have a nice quiet romantic dinner (complete with roaring fire pit) with my wife. It is very important for busy people to make time for their loved ones! Then, Thursday I played for a Chamber of Commerce event, raced from Winter Haven FL back to Lakeland FL, and played a couple of pieces in a concert program. Next week I have concerts on Monday and Friday, and will probably be playing a wedding on Friday as well. And since this week I had no time to rehearse with the North American Choro Ensemble we will be doubling up our rehearsals next week.